I know what you might be thinking, this is not African literature. Yes, I know. A couple of months ago my husband and I decided to watch The Godfather saga. I watched it when I was a very young teenager, I couldn't make out most of the story line. My tender age was a deterrent. So I decided to watch it now as an adult. I fell in love with the movie. The actors, settings and whatnot are impeccable.The movie left me wanting for more, so I decided to read the book. I went to my librarian and narrated my feelings, and asked if he had the book. He confessed that he had the same experience and had seen the movie many times now. However, I should keep in mind that the novel is not half as good as the movie. He left me dumbfounded because this is the first time I am told that a movie is better than the novel it is based on. He said I should read it anyway, perhaps, that is how I might get to appreciate and even value more the classic work of art the movie is. He was not mistaken. This novel is not as good as the film, nevertheless, it is exciting, thrilling and fast moving. I devoured this 400+ pages in 4 days while on vacation. It helped me understand more the plot of the movie. gangster Italian family based in the USA. A novel where violence, family, crime, love, extortion, religion, murder, respect and loyalty go hand in hand. There are some remarkable differences between the novel and the film, for instance; Sonny's lover played a more significant role in the book (not in the movie), there is more about Johnny Fontane and his life in the Hollywood showbiz. Michael and Kay's children were two boys not a boy and a girl as in the movie. Even Michael's mother, Mrs. Corleone had more role in the novel. However, the movie is a whole lot extensive than the novel where Michael Corleone is the main character. 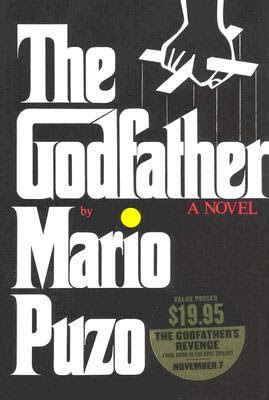 Furthermore, Mario Puzo's narrative is nothing close to poetic nor lyrical, nevertheless, his storyline is surpassingly good. The combination of family values, religion and murder is thrilling. So said, I really enjoyed reading this novel. I am going to re-watched the saga and most probably write my review on it. Highly recommended. Have you watched or read the Godfather? Glad you enjoyed the book, Mary, and the movies too. I read the book about 4 years ago. Really enjoyed it. Don't know if I'd say it was better than the movie though, as awesome as the movie was. I'll probably need to revisit both of them soon, before I can give any kind of fair assessment. hehe OK. at least we agree the movie was awesome. Una obra de arte. As we say in Spanish. Best of all time....I know word to word from Part 1 to part 3...I did read the book first as a teenager and followed up with the movie which still watch from time to time...Master Class and classic but what's it doing on an African literature blog??? Hi Anonymous, thank you for stopping by. And I am glad you are hooked up with the saga as well as myself. At least we both agree it is a master class and a classic we cannot resist to watch from time to time. Reviewing this novel on my blog is a way to faithfully let my readers know that I sometimes read other "genre" and really enjoy them. In addition, it is a way to clear my mind and get me ready for my next African literature read, just like the way they make you smell coffee beans between perfumes or eat sorbet between courses in order to increase your responsiveness for the next test. I read The Godfather years ago and I will read it all over again should I lay my hands on a copy. It was that good. Having never watched the movie I cannot say for sure. But I'm sure I will still prefer the book. Hmmm you should see the movie first... you might have a different opinion afterwards. Believe it or not. Weird that the movie is better than the book. Or was there ever an age where it happened? Movie scriiptwriters twist the books so much currently, you begin to wonder how they do it. Yeah, I totally understand what you mean, it never goes the other way round. Also let us keep in mind that Francis Ford Coppola is a genius movie maker. He wrote the script together with the author of the book Late Mario Puzo.. In my mind they extended the movie with other novels written by same author. Not sure if you have seen the movie or read the book? The movie...partly. Never got around to finishing it.